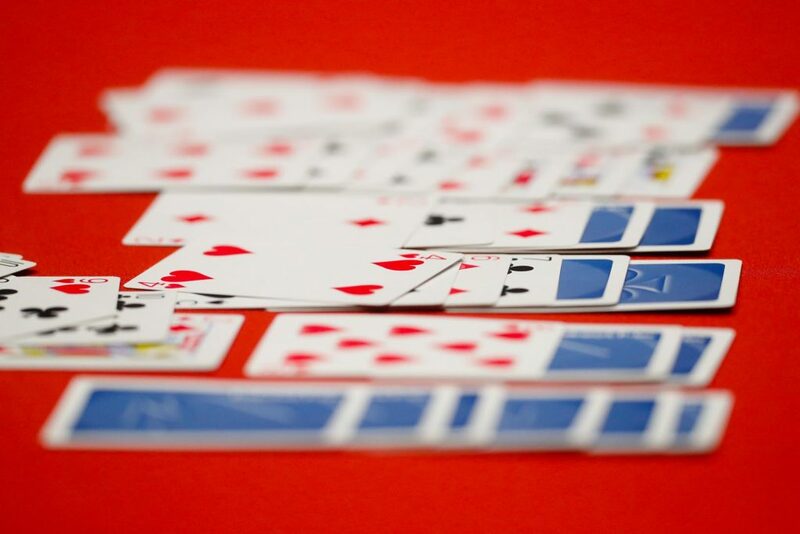 This post has already been read 9587 times! 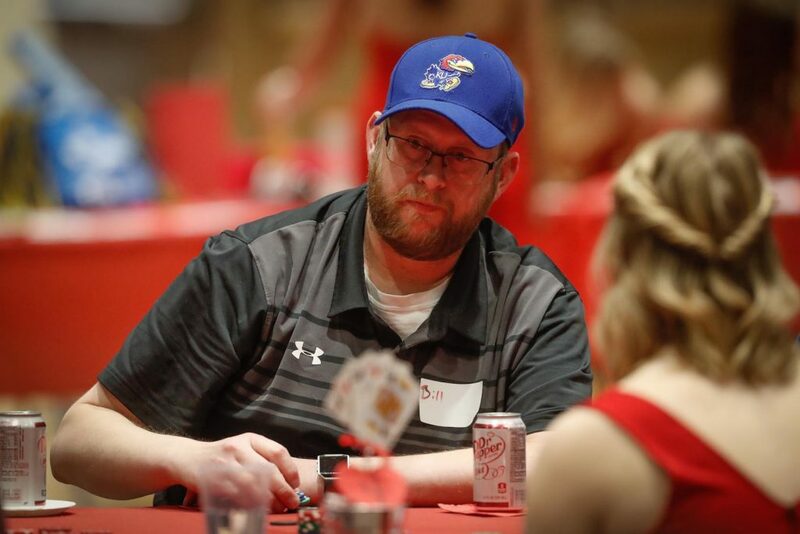 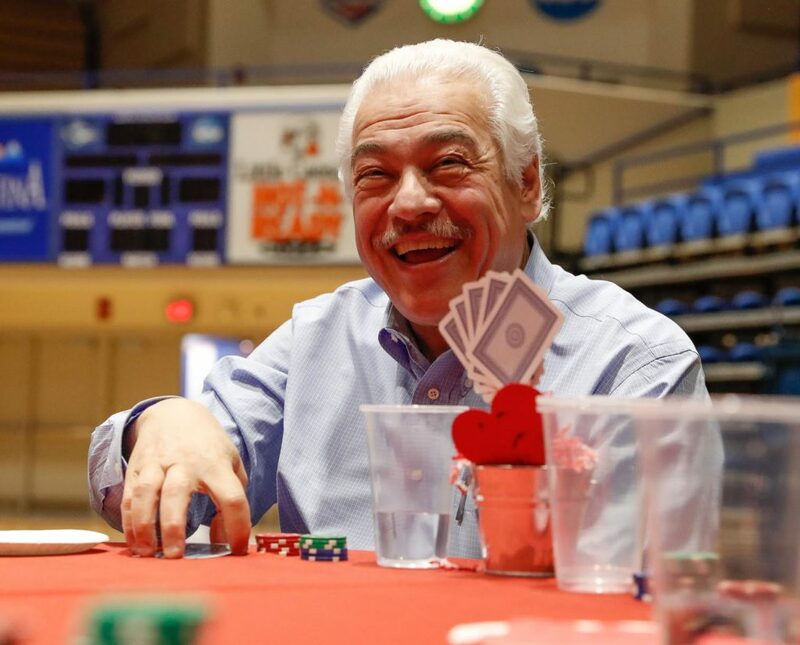 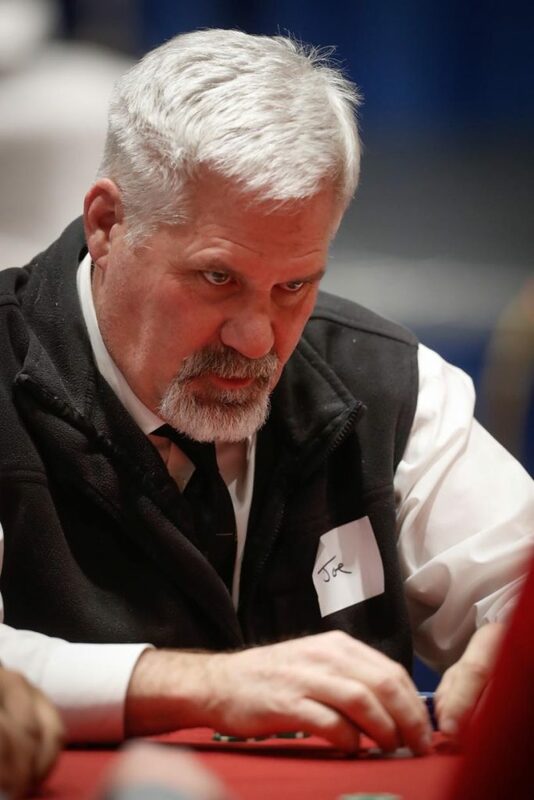 KEARNEY – Bruce Lear started playing in the Red Dress Poker Tournament four years ago when his daughter was a member of the Alpha Phi sorority at the University of Nebraska at Kearney. 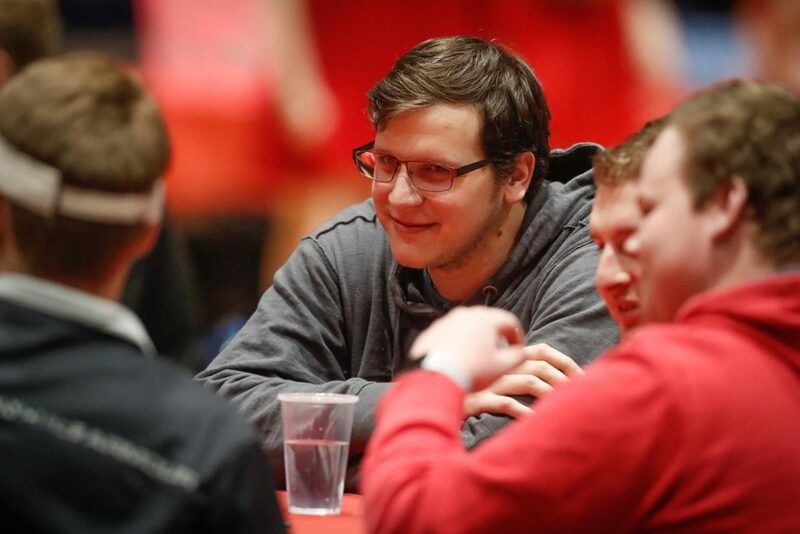 The camaraderie, cause and atmosphere have kept him coming back since then. 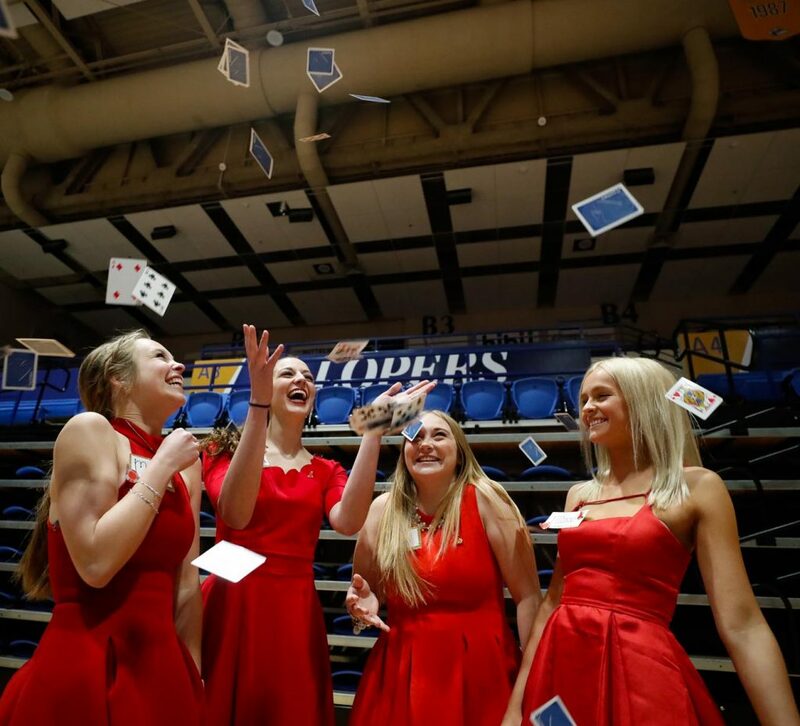 “It’s just a fun event, and it’s not so serious,” Lear said during Thursday’s tournament at UNK’s Health and Sports Center. 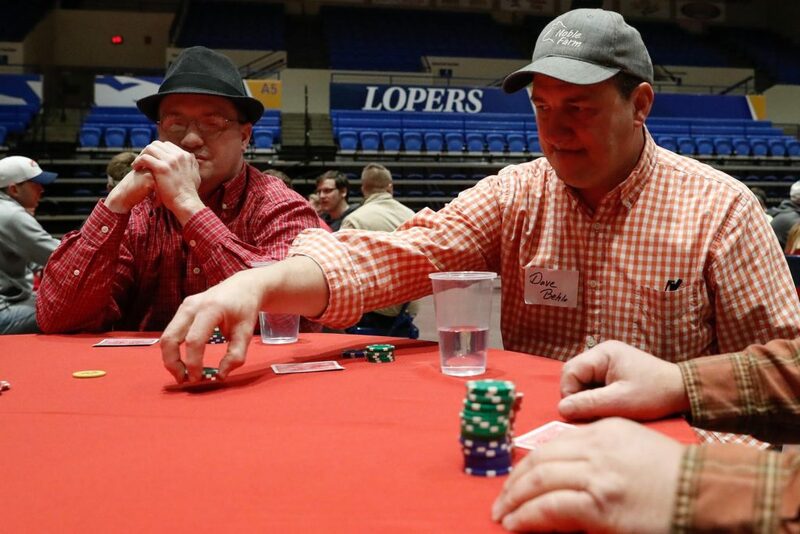 Lear, a Kearney City Council member and senior vice president at Black Oak Investment Counsel, was joined by more than 150 other players during the 13th annual event organized by Alpha Phi members. 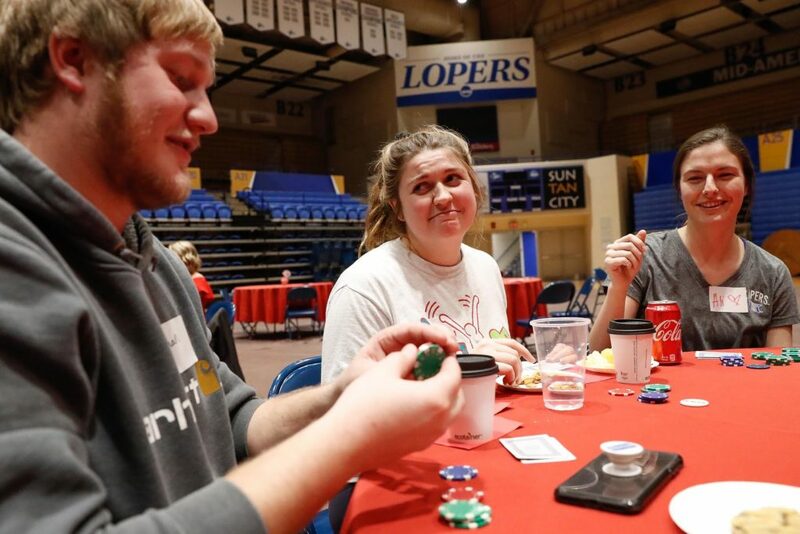 He called it a “great crowd” for the tournament, which draws a mix of community members, UNK alumni and current students. 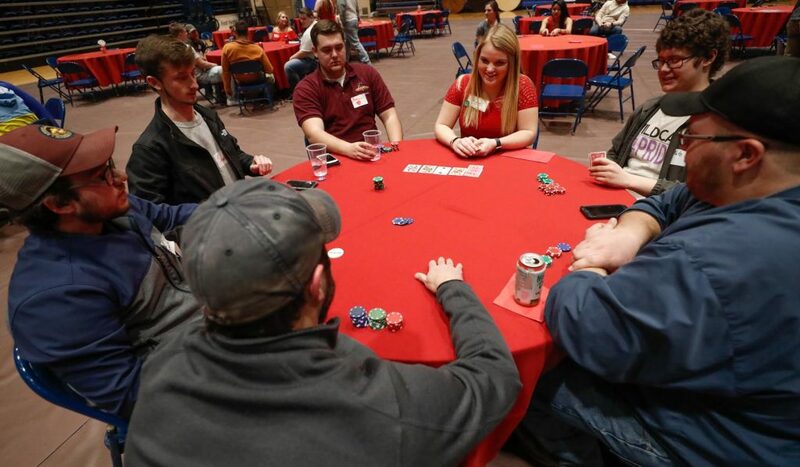 “I think the girls do a great job of reaching out to the community and getting the community involved,” Lear said, adding that the tournament brings many new faces to campus. 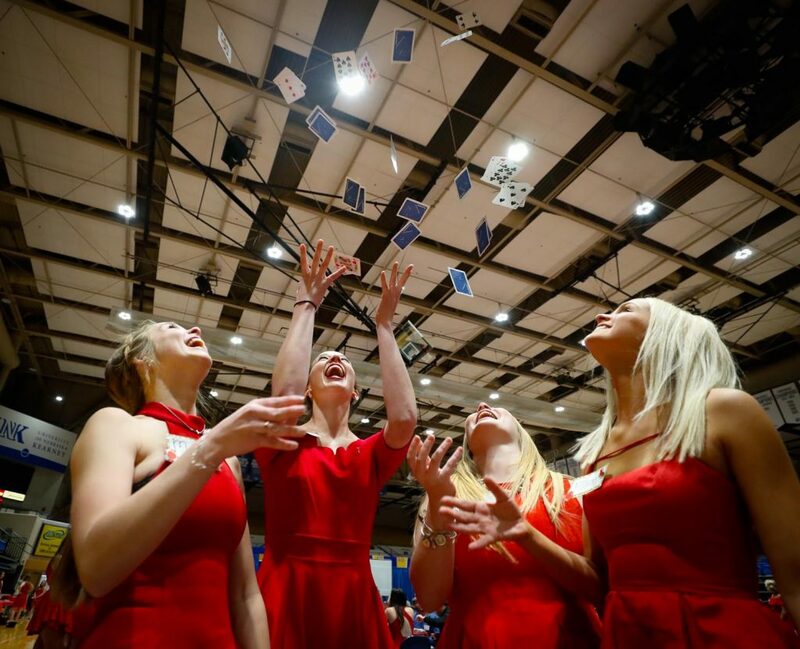 That’s part of the goal for the roughly 200 Alpha Phi members who work together on the event. 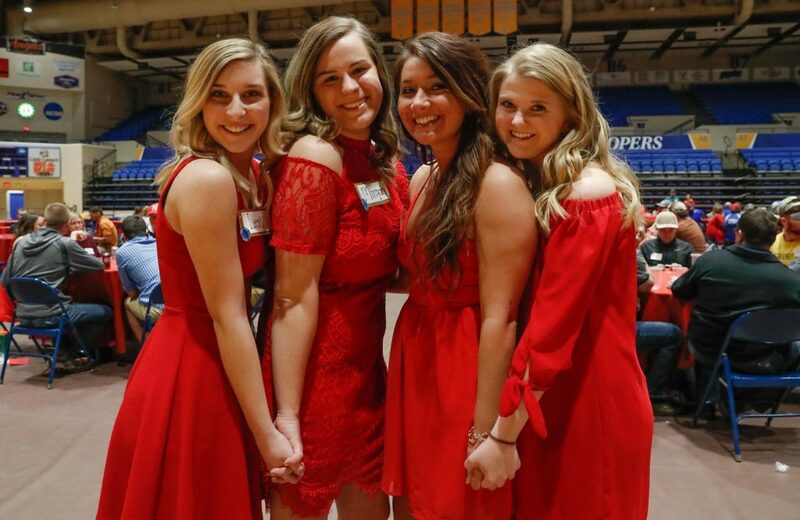 Peyton Carney, a sorority member and UNK senior from Lincoln, said the tournament never struggles to find community support. 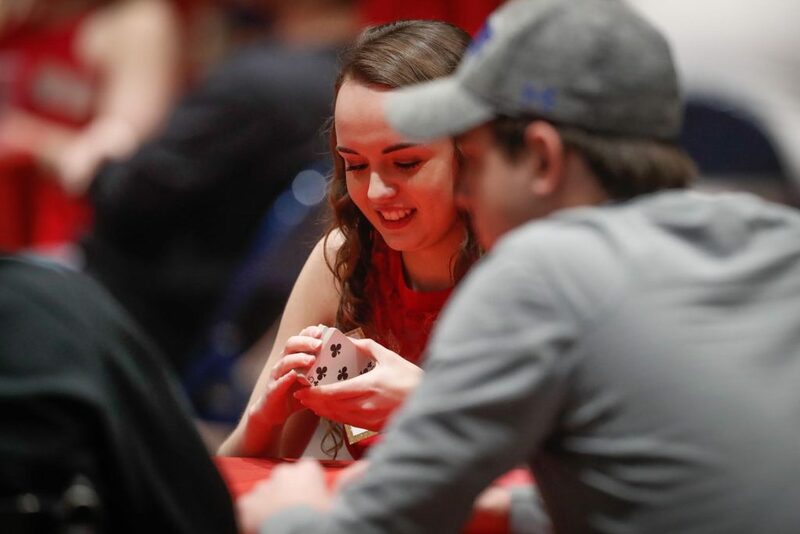 The card players show up for a variety of reasons. 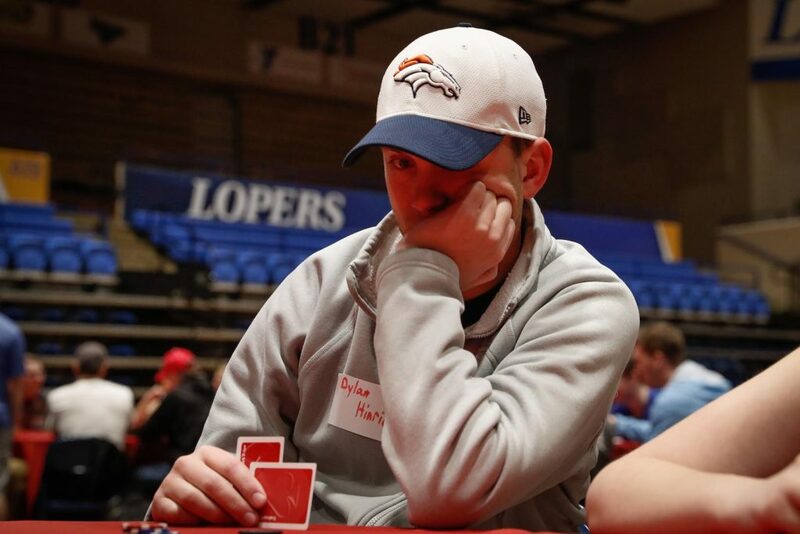 First-time attendee Nathan Rackley of Kearney was simply looking for an enjoyable night out. 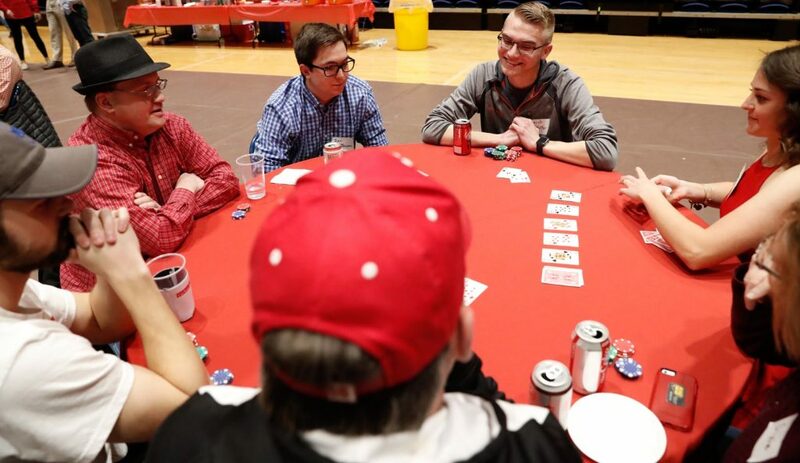 Admittedly, he’s not much of a poker shark. 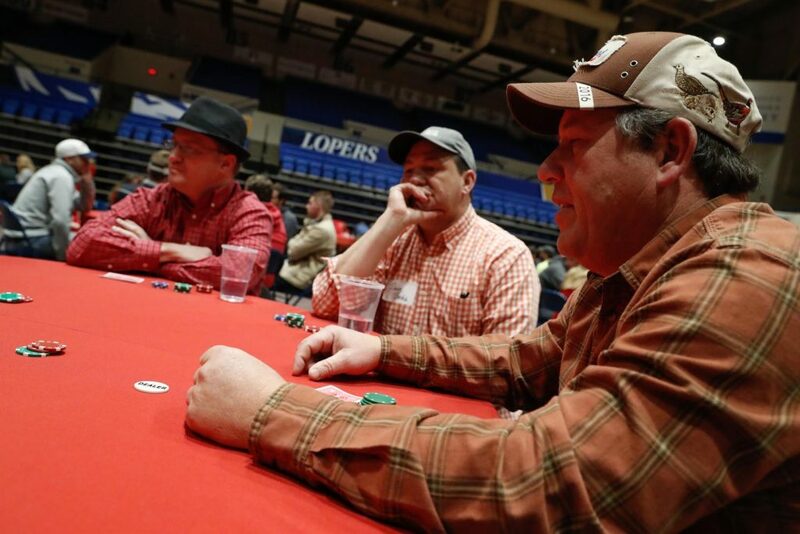 His friend Isaac Mertens, also of Kearney, had other ideas. 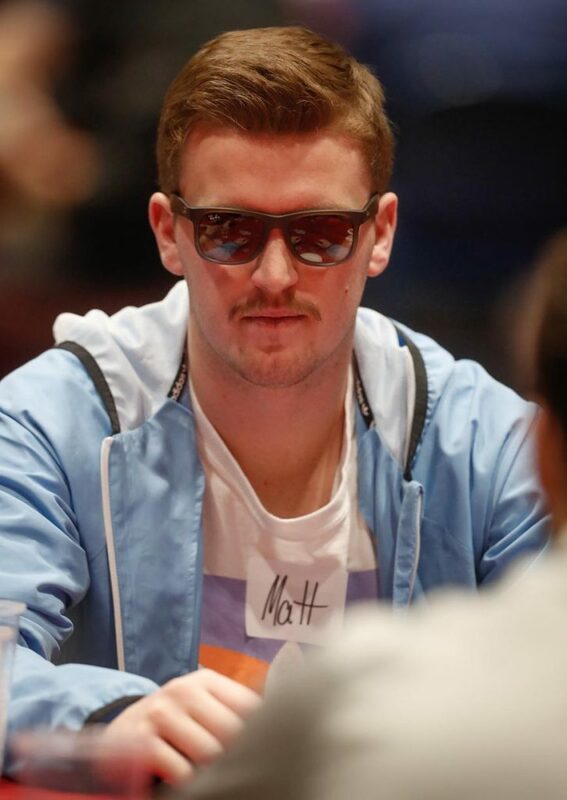 “I’m planning on taking all his money,” Mertens joked. 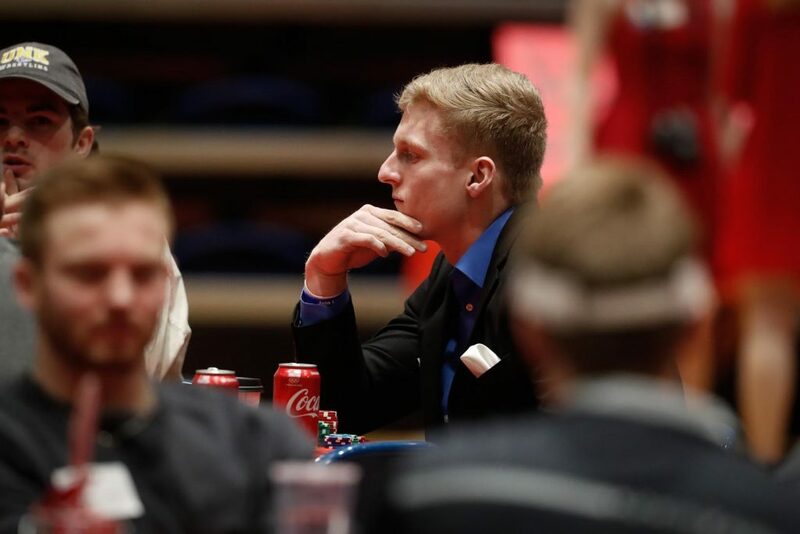 This was his third time playing in the tournament after lasting about 90 minutes in 2016 and an “awful” performance last year. 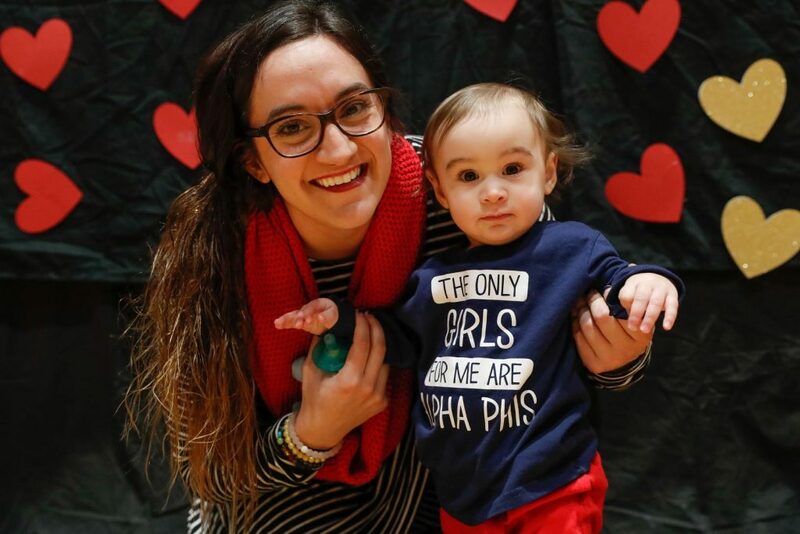 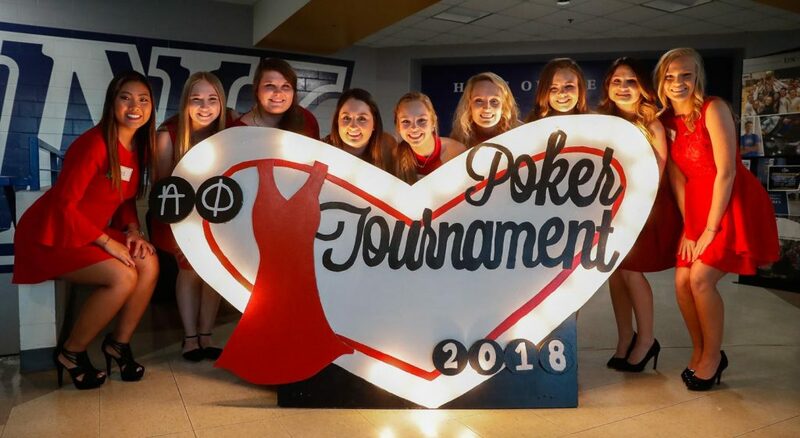 In addition to the fun and friendly competition, Mertens appreciates the mission behind the event, which raised about $9,000 for women’s heart health education and research through the Alpha Phi Foundation. 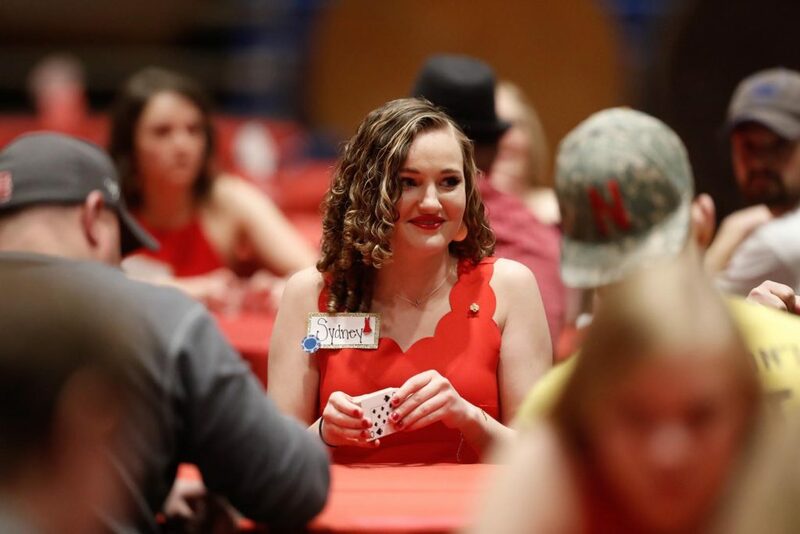 Steph Eddy, director of philanthropy for the Red Dress Poker Tournament and a UNK freshman from Republican City, announced the staggering numbers to the crowd. 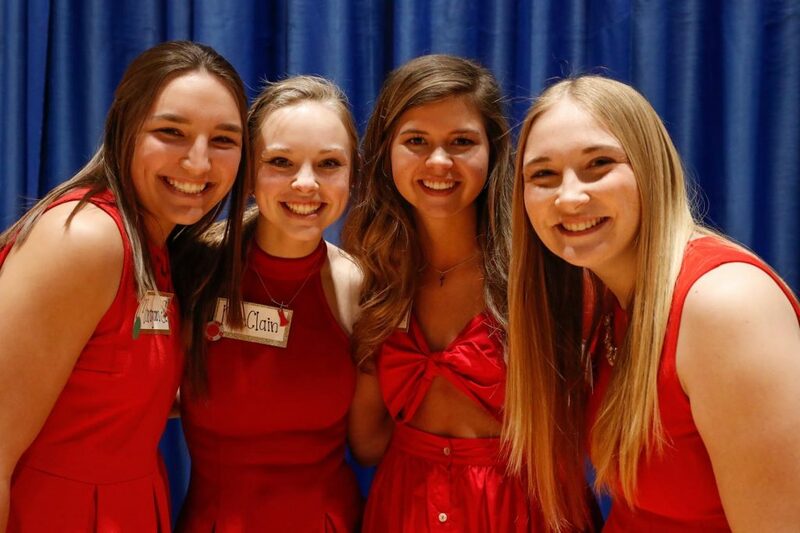 Cardiovascular diseases and stroke cause 1 in 3 women’s deaths in the U.S., according to the American Heart Association. 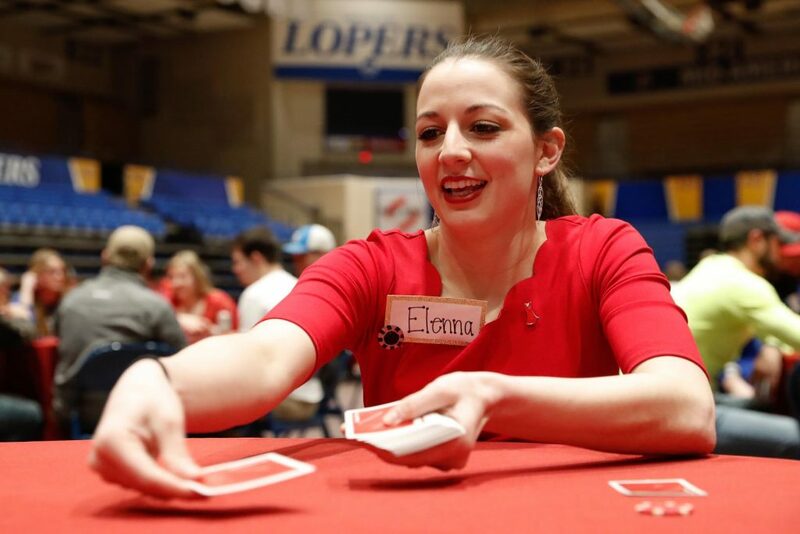 “We would like to change those statistics,” Eddy said. 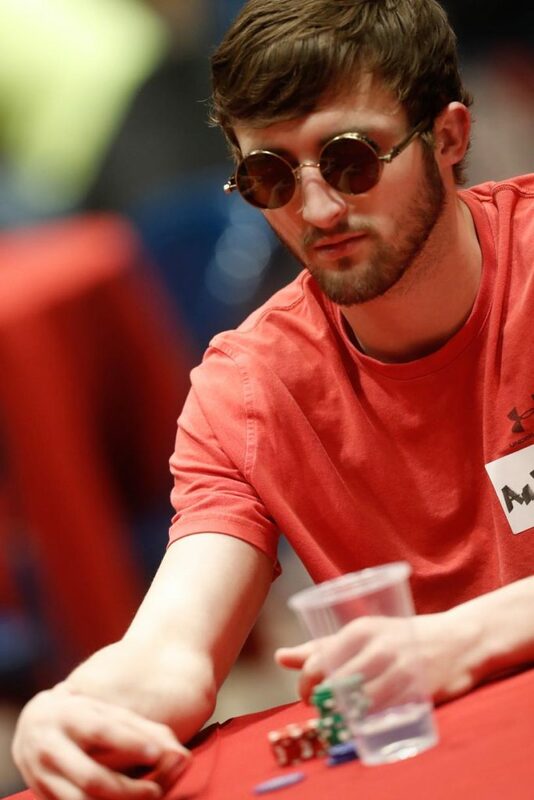 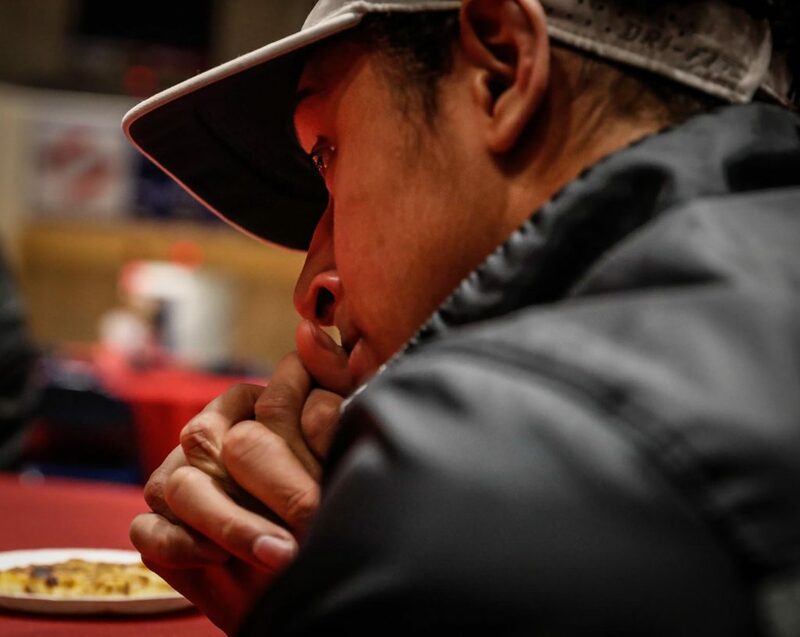 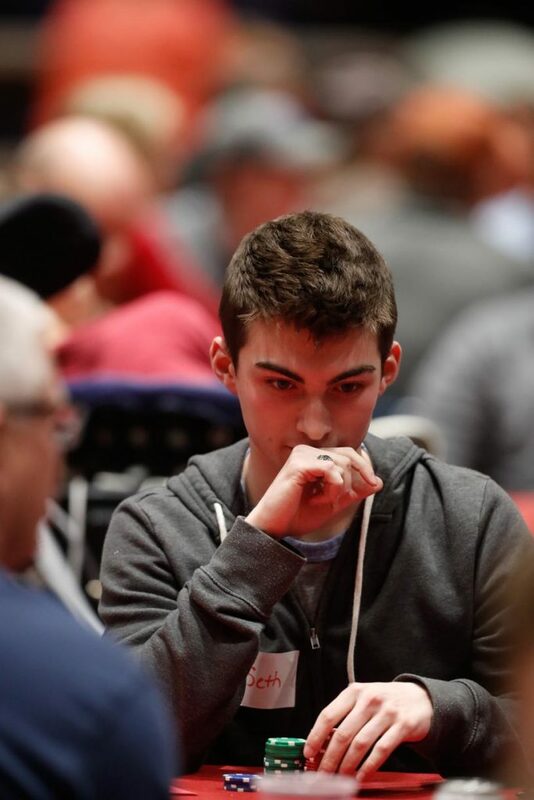 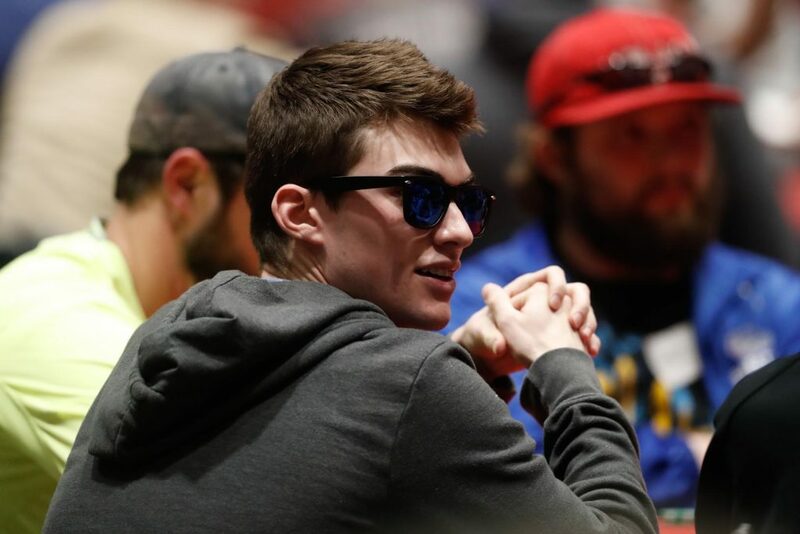 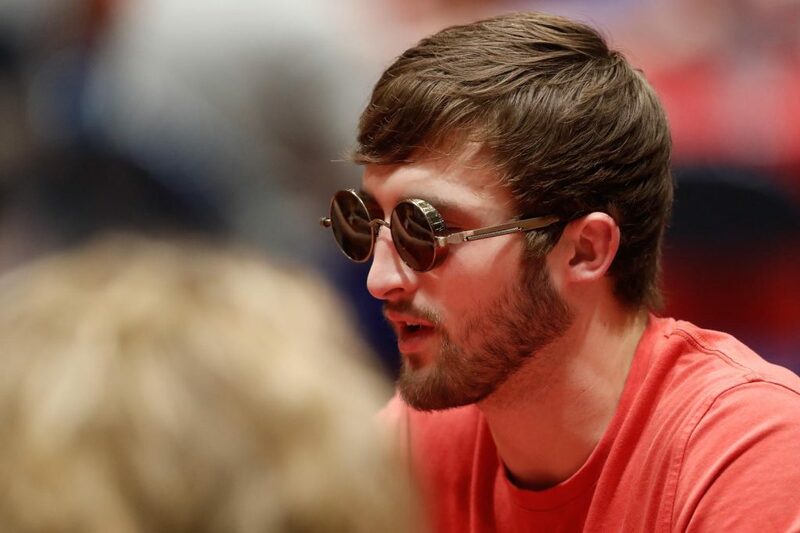 Zac Jensen was back at the table for his second Red Dress Poker Tournament. 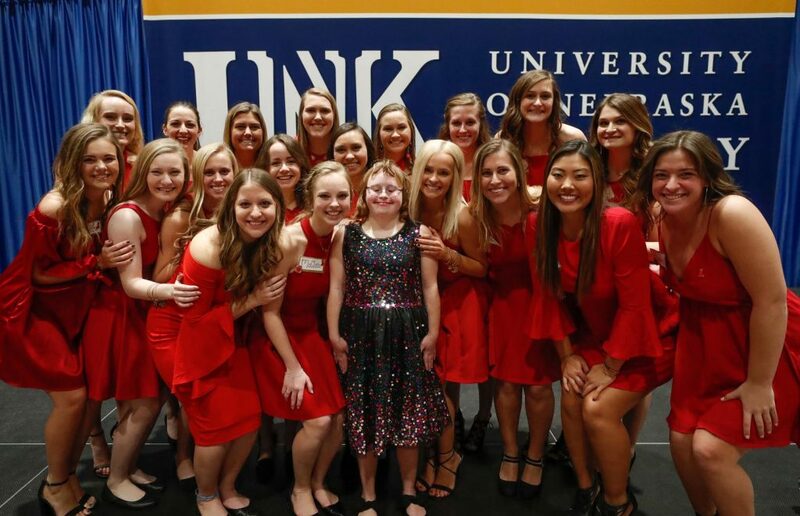 The UNK sophomore from Papillion knows many of the sorority members, and he has another reason for playing. 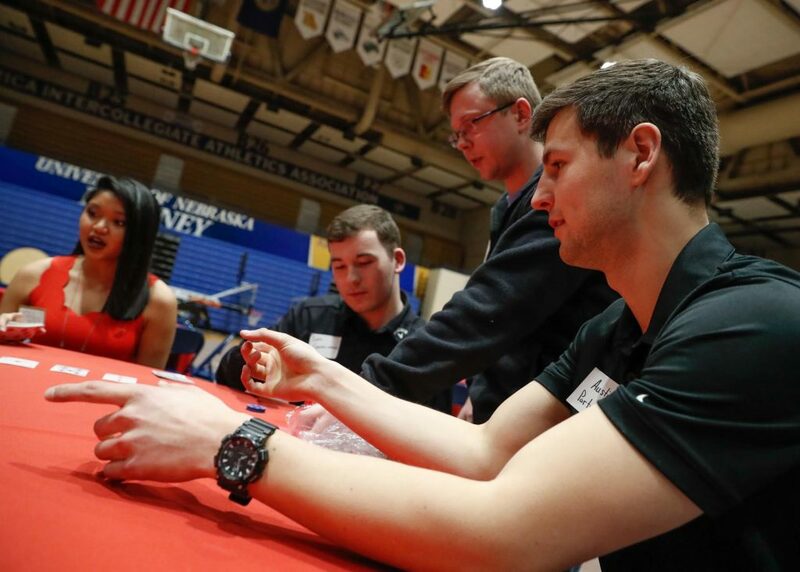 Jensen wasn’t expecting to walk away with any prizes, but there were plenty up for grabs, including a Weber grill, 50-inch smart TV and Fitbit for the top finishers. 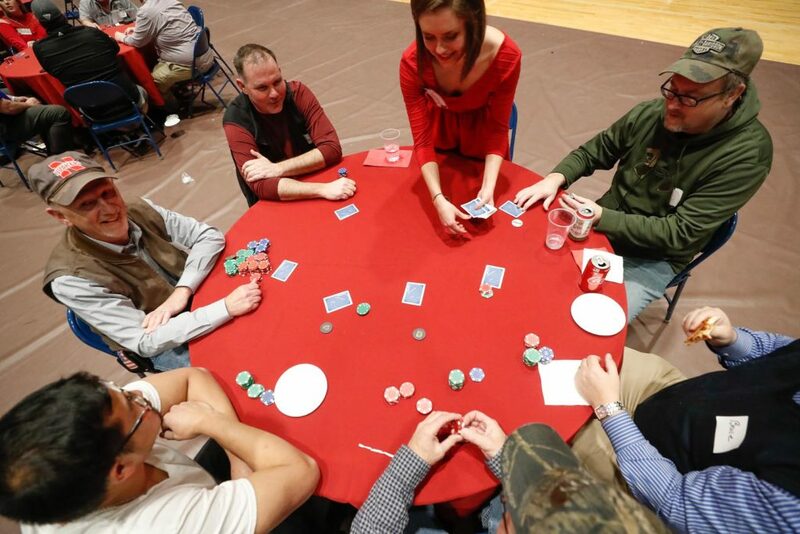 About 85 total prizes were awarded, with all but the top three donated by area businesses. 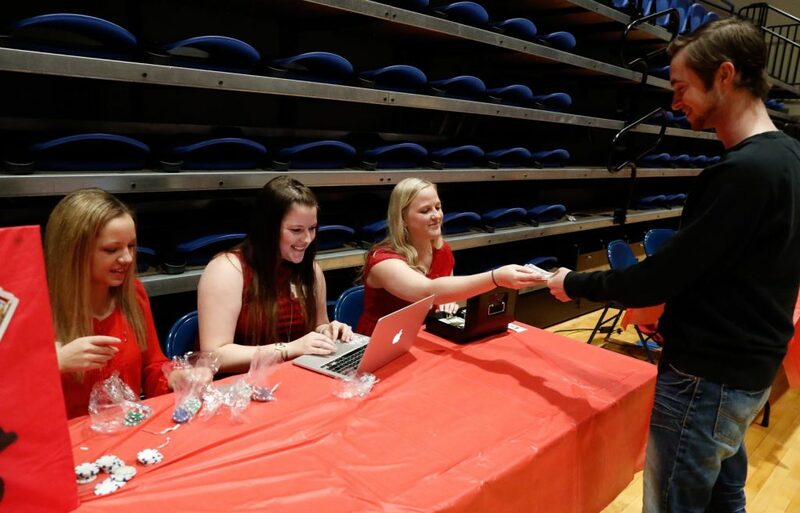 Other items were given away through raffles. 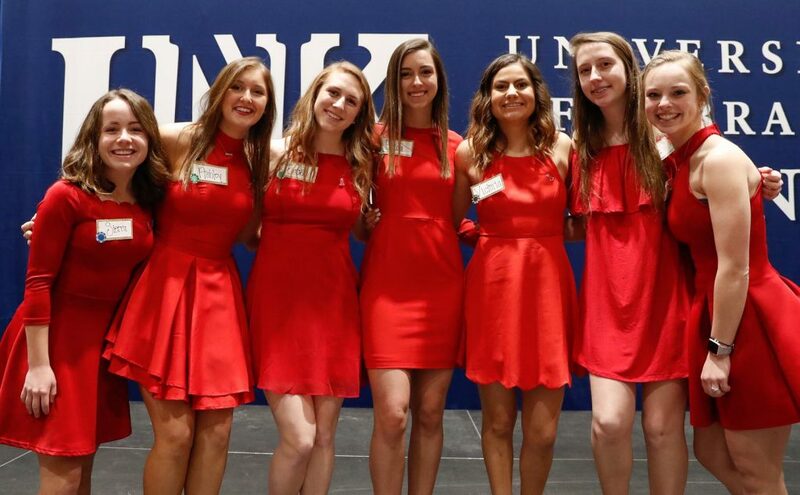 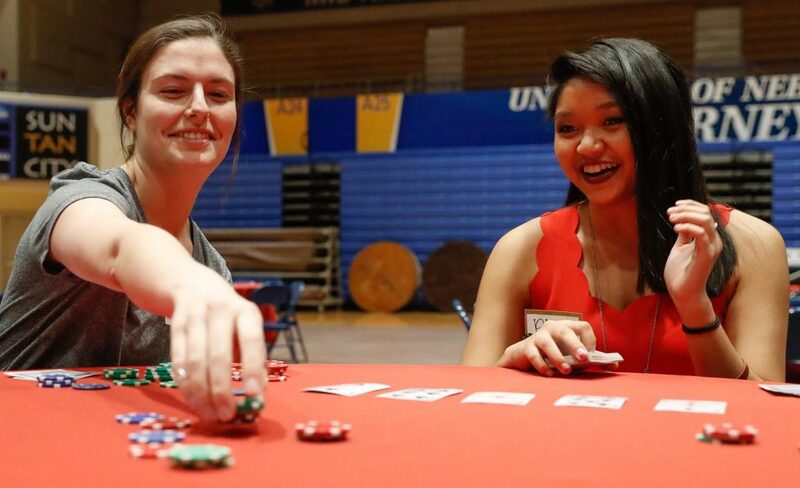 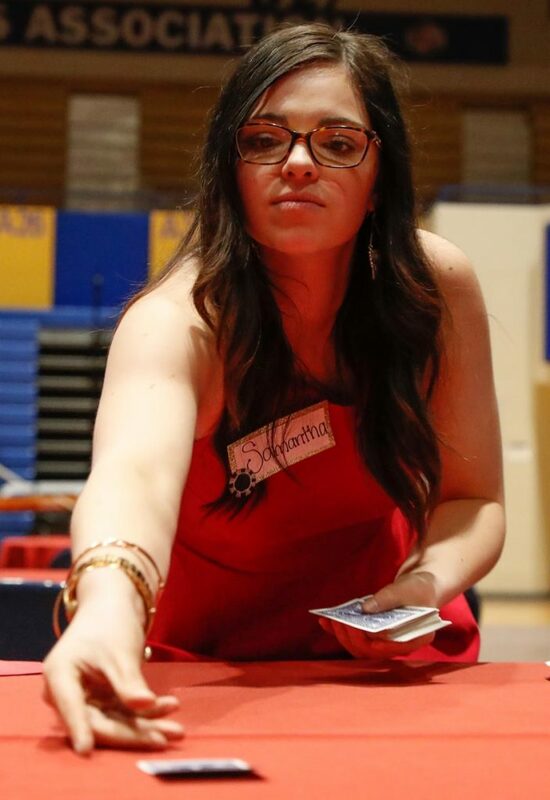 On top of their duties as event organizers, Alpha Phi members also served as dealers and hostesses for the poker tournament. 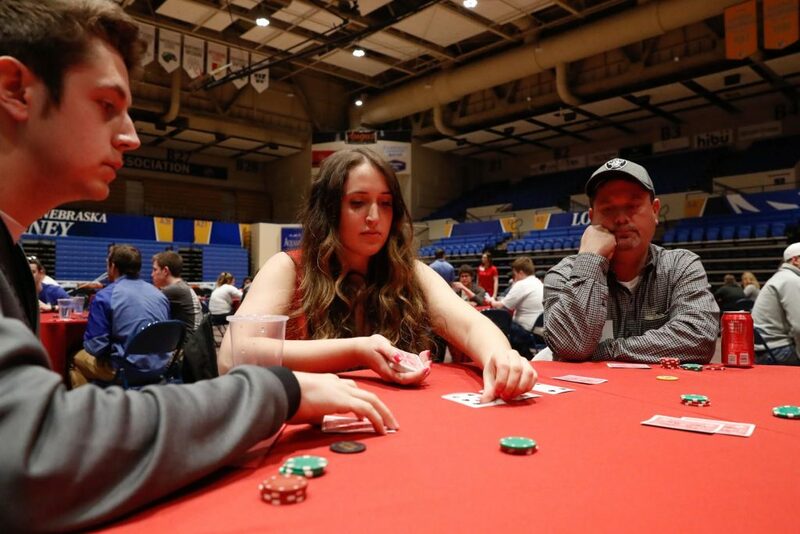 Abby Hansen, a UNK freshman from Bellevue, was nervous about her first time as a poker dealer but excited to watch the event come together. 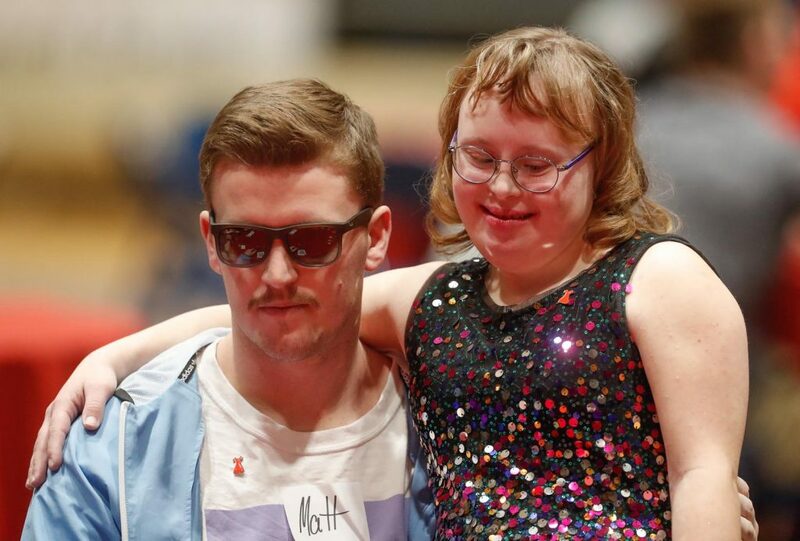 “It’s really cool seeing the impact,” she said.